The Apple iPad 2 has just launched with the iOS 4.3 and it has come with the features that no one can resist using. 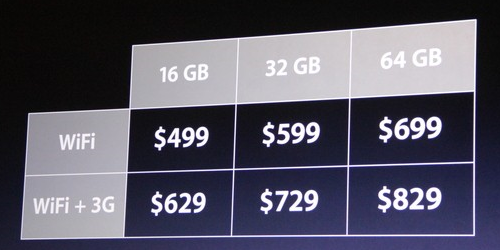 The pricing is as expected not too high, but not too less too and the pricing varies for the different memory versions, and also on whether the iPad 2 has the 3G option or not. The iPad 2 comes with the 3 memory options – 16GB, 32GB and 64GB. The pricing has not changed since the last time, and this might be an indication that the first version of the iPad would be totally discontinued or the pricing would be reduced. The iPad 2 is going to ship on March 11th, 2011. It will be shipped to 26 countries by 26th March, 2011. When comparing with the features of the previous and the new iPad, the iPad 2 is thinner and almost double faster in performance, thanks to the A5 chip and dual core processor. The iPad 2 has even got 2 cameras, and an HDMI output to connect and play up to 1080p quality.